Our Future Rooted in Our Past: Green Stamp, Brown Stamp, Red Stamp, Blue Stamp! 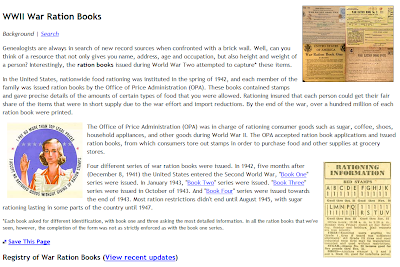 I came across a very interesting database this past week regarding the WWII War Ration Books. As a began to read, I was wondering what value these records might provide to a genealogist and family historian, so I read on. During WWII, the Office of Price Administration (OPA)was created to develop a nationwide ration program. The OPA developed a system whereby each member of a family including children were given a ration book which contained various colored stamps including green, brown, red, and blue. These stamps then were used to obtain items such as meat, sugar, butter, coffee, gasoline, tires, shoes and clothing to name a few. A few months after the United States entered into WWII, the first "Book One" series was issued. "Book Two" series was issued in January of 1943 with "Book Three" series being issued in October of 1943. The "Book Four" series was issued in the end of the year 1943. The end of the ration restrictions occurred August 1945 with the exception of sugar rationing which continued until 1947 in some parts of the country. Now you might be wondering how these food ration stamps might help the genealogist or family historian. Each of these books that the members of society received requested various information including name, address, age, etc. Books One and Three required the most in depth information including the aforementioned items, but they also requested physical descriptions. Also the fact that these books were given to each member of the family is also of great value to genealogist and family historian. The database at Genealogy Today is free to search utilizing their user friendly search engine. The results that you obtain are in a list format and then you can view each individual entry in the extracted format as well as the original document. The database contains over 6,300 entries and could provide some valuable insight and information to your family's history. 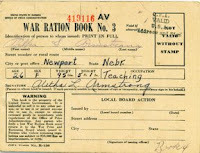 If you would like to learn more about the"War Ration Books" click Home Front Headache - Rationing or Home Front Civilian Consumption and Rationing. If you would like to research in this database click Registry of War Ration Books and scroll down a little on the page to find the search engine. Have fun!